Here is an excert from Russ Ebbets' insiders book about the Villanova track program in the early-to-mid 1970s. Ebbets joined the track program during the halcyon days of Coghlan, Schappert and Hartnett, and his short book, Supernova (Off The Road Press, 1995) relates many interesting stories (some true, some merely legendary). This one about Liquori has been validated externally. Belmont Plateau's exact distance was never known. It was dismissed as five miles but privately everyone felt that it was closer to 5.2. The course was generally a minute slower than Van Cortlandt. 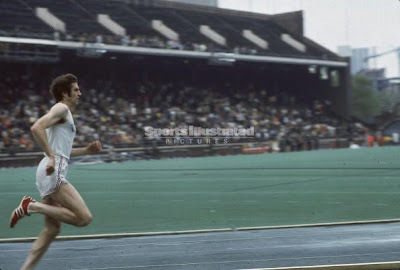 Marty Liquori and Donal Walsh ran 25:12 the same year they were running low 24s at Van Cortlandt. Therein lies the story that Jay Brown swore to me was true. Fairmont Park is a long nine-mile drive down Montgomery Avenue from campus. There was a red light every block and it could easily take 30 minutes or more if your timing was off. Villanova's fall cross country schedule began with several easy dual meets, the Big Five meet, the IC's and the NCAA's. The dual meets were against St. Joe's or Temple. We never lost. There never was much emphasis placed on these meets. They always seemed to be little more than a team time trial. The opponent usually had one good runner that cracked the top seven. The outcome was never in doubt. Marty Liquori, by his senior year, was firmly established as one of the top distance runners in America, if not America's premier miler. His credentials were impressive. He was the last of three high school milers to break four minutes and made the Olympic team by beating Villanova great Dave Patrick. Liquori was an Olympic finalist at age 19 and the conqueror of Jim Ryun in two highly publicized duels. Now imagine you are from St. Joe's or Temple or Penn and you are a good college distance runner. But this Saturday you are racing one of the best guys in the world. What do you tell your girl friend? What do you tell your friends? How do you feel going to the line? This was not lost on Liquori. He figured that if his opponent was expecting a superhuman performance, the worst thing he could do was let him down. So he decided to play a joke. The day Liquori ran 25:12 at Belmont he almost missed the race. He got one of his buddies to drive down Montgomery Avenue and drop him off about three miles from the park. The friend was then to drive to Belmont and tell a few people that Marty was jogging in from campus, a nine-mile warm up. It got to be race time -- no Liquori. Both teams had their sweats off and were getting final race directions -- no Liquori. The Villanova guys are not so concerned; we had a cast of thousands. The St. Joe's guys seemed disappointed. Jumbo is about ready to lose his mind and coach Frier his job over -- no Liquori. And then, with a flair for the dramatic, from over the first hill jogs Liquori, blue sweats, gold letters, racing shoes in hand, gliding down the hill with long graceful strides. All the while he had been jogging back and forth just out of view, waiting, waiting for the correct time to make his entrance. They held the race up for several minutes. Jumbo delivered some stern looks. Frier said some prayers. And not being in on the joke, the team could not believe Liquori was going to run Belmont, the hardest cross country course there was, with a nine-mile warm up. But he did. And he won and the time stands as one of the fastest times ever run on the course. His story done, Jay Brown would lean back his chair on two legs and state with great satisfaction, "It's the stuff of which legends are made."